I can clearly recall that when I began photographing back in the mid-1960s I asked a friend who taught photography at one of the major art schools how I should mount my photographs. He was a 35mm street shooter. He recommended that I buy inexpensive chip board from a local wholesaler, that I flush mount my photographs, and that I use black magic marker on the edges to cover the unsightly cream colored edge. And that is the way my first exhibition was hung. Things have certainly come a long way since then. 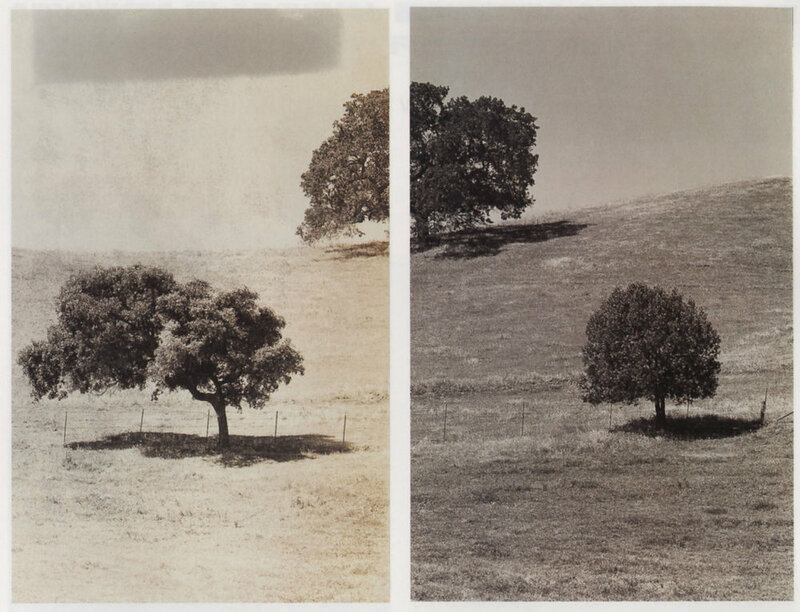 It was not until the early 1970s that discussion of archival processing and archival mounting and storage began to reach most photographers, and even then there was no consensus about how to proceed. I was among the first to buy one of Henry Wilhelm’s East Street Gallery Print Washers, the first archival print washer where each sheet of paper was separated from the others–a method of print washing so common today that I know of no serious photographer who washes prints any other way. That was also around that time that I called the chief conservator at the Smithsonian Institution to ask if it was acceptable to hinge my overmats with Kraft paper tape, as I had heard that was what was used to hinge the overmats on Rembrandt etchings. He replied that as long as the Kraft paper tape did not touch the photograph itself, it was fine to use it. Years later, in 1986, one of my assistants couldn’t believe that I was still using the Kraft tape and insisted I switch to linen tape. Today, I can’t believe my use of the Kraft tape persisted for so long. In the early 1970s, the standard for mounting and overmatting photographs became the use of 100% all-rag acid-free mounting board. This type of board–still used today by nearly all photographers–is a passive and neutral board, one that itself does not break down and harm the photographs, and when buffered with an alkaline, one that effectively neutralizes acids. It was long thought that this type of board was sufficient to prevent deterioration of photographs and other works on paper matted and mounted on it. But in recent years, the U.S. National Bureau of Standards found that this is not the case. They have discovered that pollutants other than acids readily pass through 100% all-rag, acid-free board, whether alkaline buffered or not, causing severe damage to the paper or artwork mounted on them. They found that while acids that either migrate to, or arise from within the storage container as a by-product of deterioration, are neutralized when they come in contact with the alkaline buffer, highly reactive oxidative gases such as ozone and peroxides, and pollutants such as sulfur dioxide and oxides of nitrogen, which do not become sulfuric or nitric acid until they combine with oxygen and water, are not neutralized by ordinary archival papers and boards. Upon this finding, it became evident that the old standard of boards and papers used for preservation purposes was insufficient, for these boards do not address deteriorative compounds other than acids, and, it was later found, are not even as effective as they could be against acids. It was rather distressing to learn of this, to learn that neither my photographs nor those of the other photographers of my generation, or of past generations, would be safe from deterioration, for it is virtually impossible to escape pollution, at least without building prohibitively expensive facilities. And so it was with great relief, and with considerable amazement, that I learned of a new board used for mount board and for print storage boxes that not only does not produce harmful by-products itself, but actively traps and removes pollutant molecules. This board is made with an astonishing new technology called MicroChamber™, a technology that renders the standard 100% all-rag acid-free mounting board and storage containers obsolete. I became so fascinated by this new product that I went to visit the inventor, Bill Hollinger (pronounced with a hard "g"), to get more information from the source. Michael A. Smith: Back when archival materials were first mentioned for photographers, I recall that the Hollinger Corporation was listed as the only company producing products such as archival negative envelope sleeves and other specialized products for photographers. Were you part of the Hollinger Corporation and did you have anything to do with that? Bill Hollinger: Yes, I started the archival products division and was the President. MAS: And then you started Conservation Resources International (CRI)? BH: Yes, in 1979. I wanted to produce more varied products directly related to superior archival materials. MAS: Can you tell us something about CRI? BH: We do basic research which leads to the development of new and better products in the conservation/preservation field. Our products include specialized equipment, chemicals, paper, paperboard and plastic conservation housings, and papers ranging in thickness from lightweight tissue through heavy boxboards. In the United States, we work mainly with papers and paperboards. We were the first company to produce a standard gray/white archival boxboard with alkaline buffering throughout the board. We were also the first company to develop and offer a permanent, durable boxboard that was lignin-free and sulfur-free. And more recently, we developed and patented a combination alkaline buffered/non-buffered board, and MicroChamber™ papers and boards, which contain molecular traps such as activated carbon and zeolites. MAS: We’ll get to the MicroChamber® technology in a minute, but first can you tell us about the CRI lignin-free products? I have been using these products for many years. BH: Sure, but first some quick history. The first archival products were boxboard with an elevated pH. When it was found that they were not doing the job, an alkaline reserve, typically Calcium Carbonate (CaCO3) was added as a buffer. For a great many years, the general consensus in the archival preservation field was that the alkaline reserve in paper and boxboard dealt effectively with various harmful acid and oxidative gases, such as nitrogen dioxide, sulfur dioxide, ozone and peroxides. Industry-wide, we had been told that this would solve all of the deterioration problems. But research showed this was not true. We were in contact with the Smithsonian and learned that in spite of storage boxes with a pH up to 8.5 or even 9.0, and the addition of CaCO3, stored materials still became acidic and were deteriorating. Investigation showed that the lignin in the board used in the storage boxes was causing the build-up of acid and the subsequent deterioration. MAS: What is lignin, and how did you solve the problem? BH: Lignin is a complex organic polymer that acts as a structural matrix in trees and in other plants. We found a way to remove the lignin from the paper and board in our products, and, as you know, produced our lignin-free boards and papers. Then we did further research and found that although the lignin-free products were effective against acids, the by-products of deterioration of the stored materials not yet in an acid state, and the various atmospheric pollutants, were causing deterioration. And the lignin-free materials were not dealing with that. MAS: Where do these pollutants come from? MAS: How were you able to solve the problems caused by these pollutants? BH: We did more research and after thousands of hours of testing over several years, we invented our patented MicroChamber™ technology. MAS: What is MicroChamber™ technology and how does it work? BH: MicroChamber™ boards and papers contain various molecular traps and alkaline buffers. Typically, the boxboards contain both activated carbon and a specialized molecular sieve we developed specifically for these products. The MicroChamber™ products themselves actively trap pollutants. MAS: Exactly how do they do that? BH: Activated carbon is an inert, porous graphite described as "graphite plates." The presence of imperfections in the plates’ structure leads to the formation of a rigid skeletal structure that can comprise 75% or more of the total volume of the voids in the activated carbon. The voids are adsorption centers using primarily London dispersion forces (a Van der Wall’s force) to hold the trapped molecules. Molecular sieves, or zeolites, are aluminosilicates with a pore, or opening, configured to allow the entry of certain molecules, while excluding others. The pore leads to a cavern or storage site where the molecules are trapped. The trapped molecules are bonded covalently to the wall of the internal cavity. This cavity leads through another opening to another storage site, and so on. This gives the molecular sieve tremendous absorptive capability. The molecular sieves we developed for our product are hydrophobic, so they do not remove water, and they are acid resistant so they do not lose their crystalline structure, and thus their ability to absorb, if exposed to an acidic environment. Lignin-free products containing alkaline reserve deal only with acids, and only then when an acid actually contacts a bit of alkaline reserve and reacts with it. The MicroChamber™ products remove not only the acids, but also neutralize and remove the highly reactive oxidative gases like nitrogen dioxide, sulfur dioxide, ozone and peroxides, and the other harmful compounds such as the pre-acidic by-products of deterioration which form organic acids, like aldehydes, which are unaffected by alkaline reserve. Additionally, MicroChamber™ products are significantly more effective at removing acids than a buffered-only paper. For example, a MicroChamber™ file or print folder has the capacity to remove 170 times more acid than the equivalent buffered-only folder. MAS: That sounds incredible, but doesn’t the board eventually get filled up with pollutants, to a point of saturation? BH: Theoretically the boards could get filled up, but practically speaking, based on pollution density tests made by the EPA in environments in New York and Los Angeles, MicroChamber™ products should continue to absorb pollutants for thousands of years. During laboratory tests, we see that materials protected by conventional conservation papers, both buffered and non-buffered, are completely destroyed, while the material protected by a MicroChamber™ product is totally unaffected. The acid-removal capacity for MicroChamber™ papers is quite far beyond what we enjoy in standard archival products. The problem with giving a specific prediction is knowing with certainty which molecules and in what concentration will be present in the storage area. MAS: So the board itself absorbs the pollutants so that the pollutants cannot reach the photograph. This is almost unbelievable. Who makes MicroChamber™ products and are they very expensive? BH: CRI produces a variety of white, tan, and black MicroChamber™ products that are primarily used in archival storage and preservation, and in areas like exhibit cases to remove pollutants and off-gassing which can harm the object on exhibit. Nielsen & Bainbridge produce MicroChamber™ products under the trade name of ArtCare™. They make mat and mounting boards in rag and alpha cellulose, and in a huge range of colors. They also produce an ArtCare™ foam board, which may be of interest to some of your readers. And surprisingly, the cost is very little more than the cost of the old standard rag board. MAS: Rarely does a new technological breakthrough occur that renders accepted standards in a field obsolete absolutely and forever. Even more rarely does one of those breakthroughs so directly affect our photographs. Thank you Bill, you have done all of us in photography a tremendous service. BH: And thank you, Michael. It has been a pleasure speaking with you. Developing and producing the ultimate archival materials is like a crusade with me. There are so many papers and works on paper of important historic and/or aesthetic value that should be protected and preserved for future generations. Subsequent to my conversation with Bill Hollinger, I wanted to have ArtCare™ board tested with my own photographs. Although I had seen test results from other photographs–results that had astonished me–I wanted to see just how good this board was with photographs that I knew were processed well beyond normal archival standards. I submitted my black and white archivally processed prints to the testing labs at Nielsen & Bainbridge. And, to see how this board might also protect color photographs, I asked David Graham to send prints for testing. Two tests were made with my black and white photographs and two were made with the color photographs. For the tests, my prints were cut in half. I wanted to make sure the test results couldn’t come from unequally processed prints. 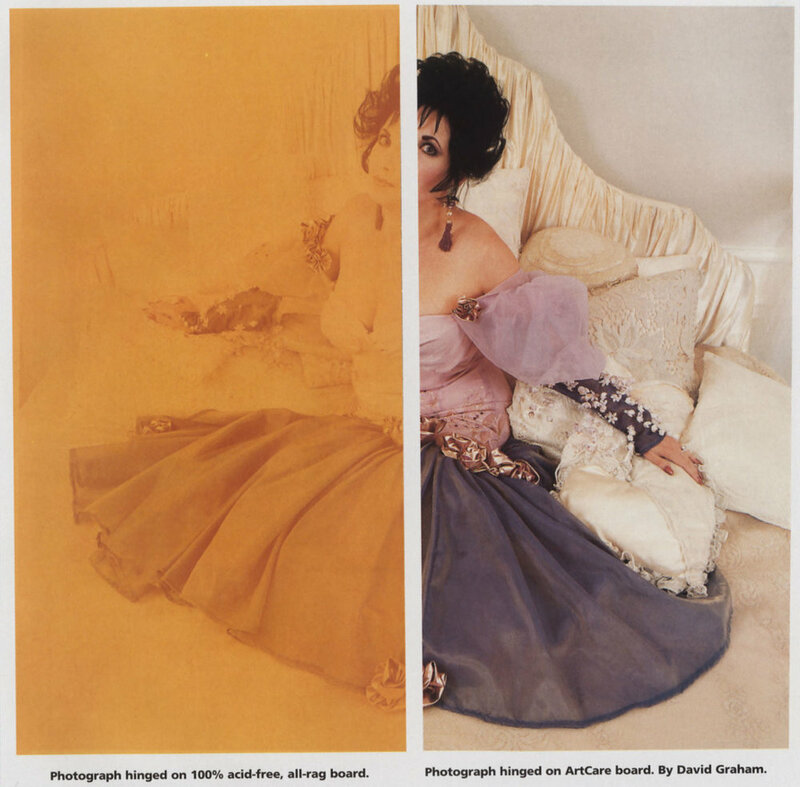 For the color photographs: one of David Graham’s prints was cut in half, and for another test two different prints were used. In one test, one half was dry mounted on high-quality 100% all-rag acid-free mount board; the other was mounted on ArtCare™ board with the MicroChamber™ technology. In the other test, both the black and white and the color photographs were not dry mounted, but were hinged–again, one on ArtCare™ board with the MicroChamber™ technology and one on standard 100% all-rag acid-free mount board. The tests were made by sealing the photographs with glass on the front and with aluminum tape on the sides. In a sealed chamber, high concentrations of pollutants were then blown through the back of the mount board. The test approximated aging for a minimum of 100 years. I could hardly believe the results of these tests. They speak for themselves. (See test results: Illustrations I — VIII.) Curiously, the dry mounted photographs, both for the black and white and for the color prints, fared far better than the ones that were hinged. This would indicate that no matter what type of board is used, dry mounted prints are better protected than ones that are only hinged or affixed with photo-corners. The dry-mount tissue acts as an additional barrier. Besides being the most archivally sound mat board I have ever seen, ArtCare™ board also has a most beautiful surface. As a result of these tests I have switched all of my mount boards, negative envelopes, and storage boxes to ArtCare™ materials. I believe these are products all photographers and conservators should know about.